Melanie Graham’s ‘ Our Table’, an installation inspired by the awareness of violence involving women and girls, creates a subtle but powerful message. Graham’s installation seemed at bit unorganized at first, but once examined, I noticed that her concepts, especially the parallels she creates between food decay and abductions, are quite interesting and ingenious – not to mention quite impactful. The Project is based on personal research and meetings with the families of missing women and girls. Her discoveries culminated in a planned feast especially dedicated to the six missing/ abducted women and girls featured in the show. With the exhibition, she hopes to draw attention to this growing issue of social injustice in our culture. 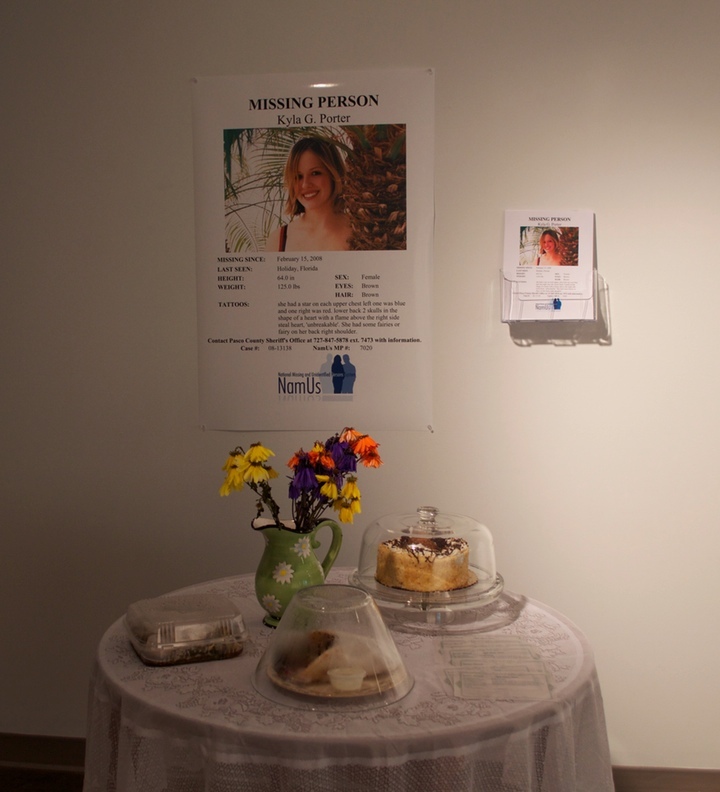 ‘Our Table’ is comprised of five tables, each accompanied by personal photos provided by the families, favorite foods, and personal objects. The show is tied in quite nicely with Graham’s poetry; brilliant and powerful words that addressed the issues at hand quite strongly. 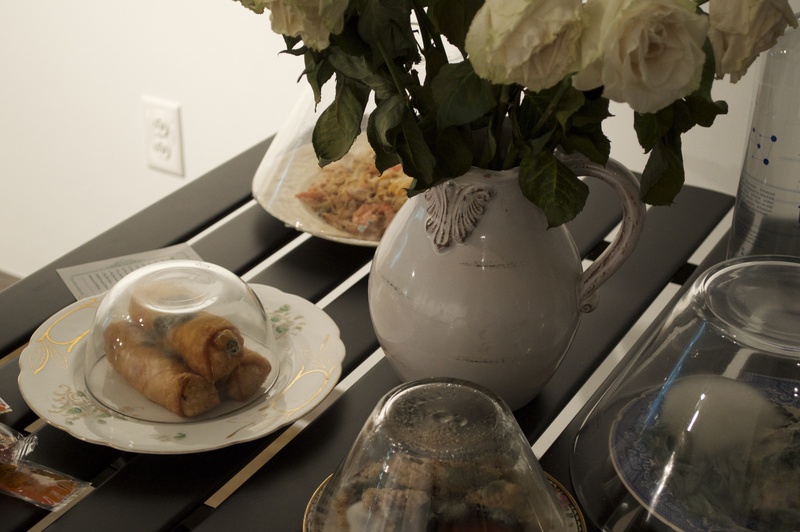 If there’s once thing that still lingers in my mind about this particular installation is the rotting food. I guess I forgot to mention that the food placed on these tables have been there since the day of the opening (Nov. 12th, 2013). As you can imagine, fresh foods go bad pretty quickly if not refrigerated. 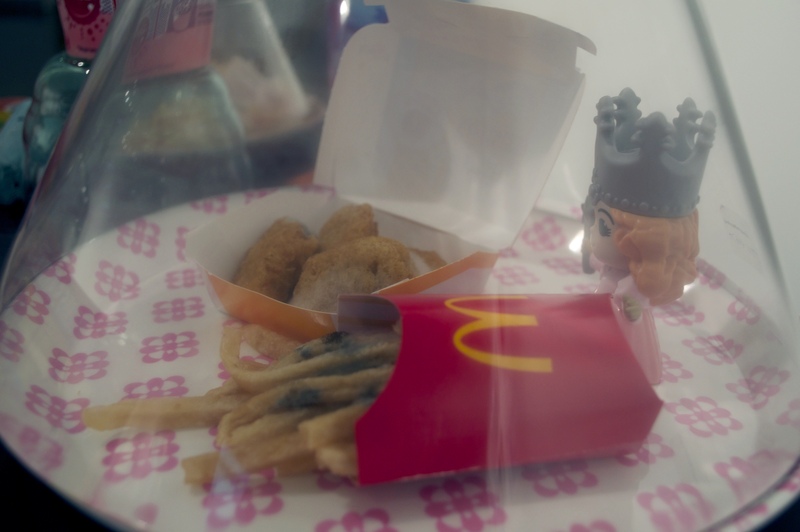 Except for the McDonald’s burger and fries found in one of the girl’s tables, much of the food left behind, has been filled with black and green mold. The decay is quite repulsive, and I think that this is what Graham was looking for. Although the smell wasn’t an issue ( all of the fresh foods were covered with a glass lid), it was impossible to not imagine the smell of the rooting foods. Both the look and the smell (even if imagined) lingered throughout my visit, and well after it too. Graham’s ‘offerings’ were not just a gesture of respect and memorial, but they were also a literal translation of the sickening behavior of the abductors-the only cause of the missing girls and women. Graham is currently in a Master’s of Fine Arts program and has a PhD in Creative Writing. Her goals are to complete her MFA and publish her first book about America’s cultural obsession with violence. 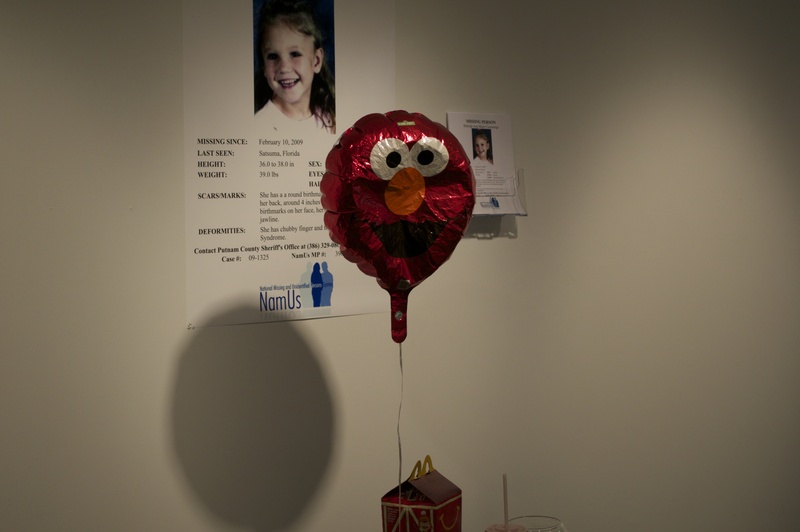 The exhibition is up in display until November 26th,2013 at the Centre Gallery at USF. Though not a strict fit for the ‘-ism’, Kirk Ke Wang has the endearing optimism of a Conceptual artist. A project’s plausibility is irrelevant; the idea is everything. Wang related the idea for his current installation to me a few months ago in his Seminole Heights studio. However, it was clear to me at the time that, lest it be hung simply as a written description on an index card, the project would almost certainly require some revisions and compromises. 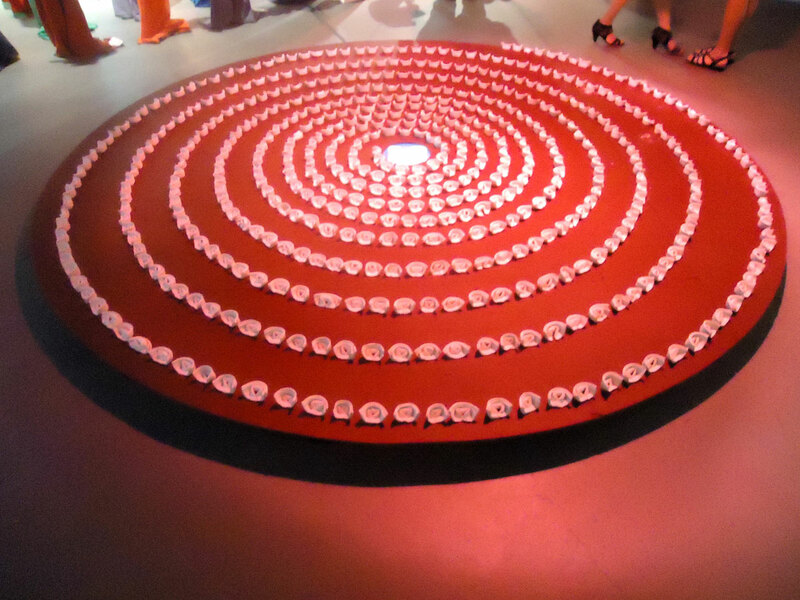 Meanwhile, its less plausible aspects illustrated exactly how comprehensive his concept is – little in the installation Sugar Bomb is incidental. To that end, while Wang’s installations are perhaps becoming more ambitious in size, it is these little and seemingly incidental details that may be the most effective components. A “bomb” papered with tobacco leaves are as much a wave to Cuba as they are a nod to Ybor city, where the gallery can be found. They hint at the laborers that harvested them and the immigrants who rolled them. It’s likely the tobacco leaf would only operate with such potency in Ybor City. Still, it’s a rare object that at once wields subtlety and power while navigating away from cliché. The bombs scattered through the installation are literally filled with such symbolism – bomb casings contain toy soldiers, Skittles, sugar. The playfully colored bombs and their pleasant payload imply that they are not weapons of firepower but weapons of desire and information. It is unclear who the bombs are intended to target or who dispatched them. In some way, perhaps, the bombs are from and for everyone. His installations avoid dogmatizing, instead revealing an issue’s complexity and asking for its careful consideration. In Sugar Bomb, Wang presents global politics as seen by a Chinese man moving through America, and an American man moving through Cuba. It’s difficult, if not impossible, to discern what is right (morally) or even right (correct) in any viewpoint. Wang isn’t being reckless here with his installation’s concept: complexity shouldn’t be mistaken for ambiguity. When the works asks “Should we fear?”, it isn’t looking for “I don’t know.” Its looking for the beginning of a discussion that leads out of the gallery doors and on to Ybor’s brick streets. With that objective, Sugar Bomb definitely hits its target. Sugar Bomb will be on view through September 30. A reception an artists talk is scheduled for Thursday September 12 5pm-8pm. 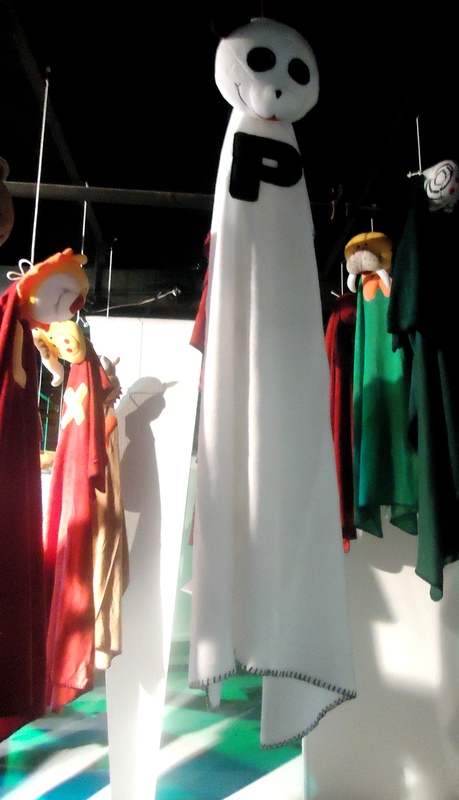 All events take place at the HCC Performing Arts building gallery. 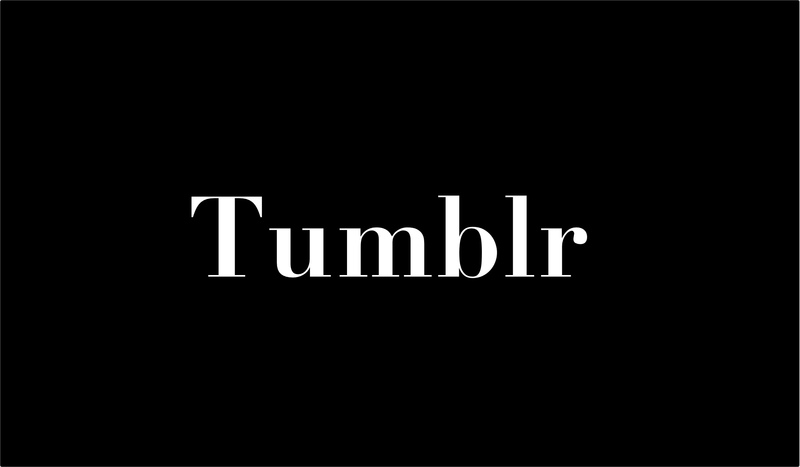 I’ve been thinking about changing the title of this series before no one’s wearing skinny jeans anymore. How about “Slap on the Slap Bracelets, Kids” or “Lace Up the Renaissance Fair Shirts, dudes”. Let me know if you have any ideas. Anyhow, April is turning out to be a busy month and this weekend we’re hanging out in Tampa. 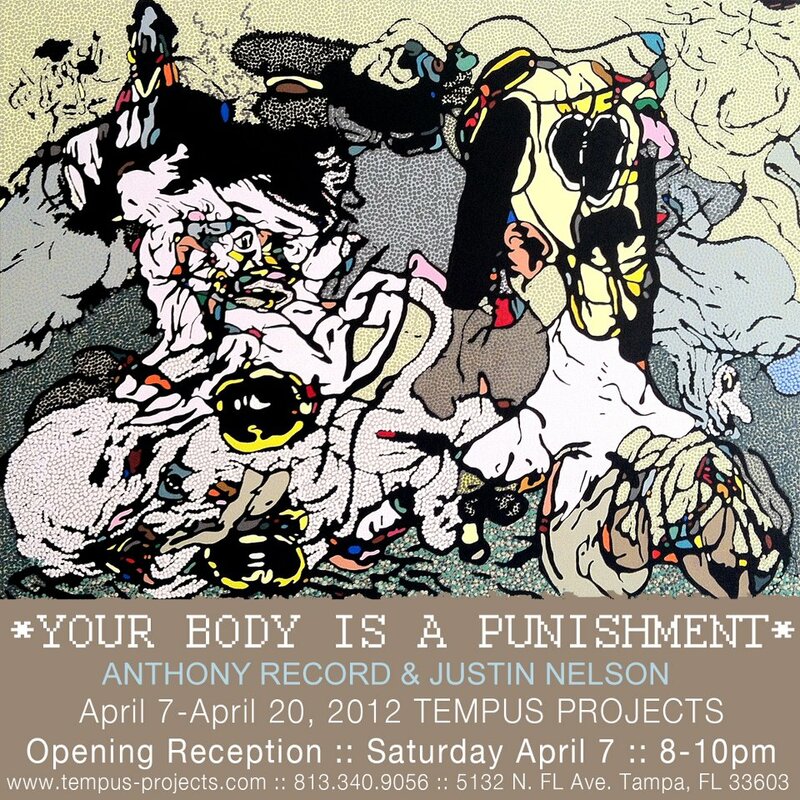 Tempus Projects presents an exhibit featuring two Tampa Artists, Anthony Record and Justin Nelson. The two share more than that, though: on the art continuum of abstract to representational they both land in the ambiguous middle-ground. Justin Nelson, represented locally by St. Pete’s CEFA, lives and works out of Tampa. I was surprised to hear he was a hometown artist, first running into his work far from home on a Canadian art blog. This in itself says something about Nelson’s work – its easy to see why it could get viral with art nerds (like me) online. It has a touch of the popular surrealism of the Low-Brow style without its low browishness. Nelson consistently hides and abstracts areas that our eyes immediately scan for such as faces, eyes. This forces the viewer to use hands or silhouettes as reference points. It’s unsettling in a pleasant way. Trust me: that makes sense. Anthony Record lands a little closer to the abstract end of the spectrum. However, his paintings don’t blur the line between abstract and representational a la Annie Lapin – Record’s work seems to have a foot firmly planted at either end. His newer paintings resemble ancient ecclesiastical work such as stained glass (solid colors and heavy black outlines) and mosaics (dotting instead of painterly strokes). These paintings honestly feel like they reference the representational and the abstract, the earthly and the heavenly, the concrete and the virtual. It reminds me of a Guy Debord quote: “The spectacle is the material reconstruction of the religious illusion.” The gallery’s statement was right on. It’s Anthony Record’s yarn work that I’m particularly looking forward to seeing. If anyone has recently inherited any money, picking up one of these pieces for me would make me especially fond of you. His yarn pieces seem to slip out of representation like lo-res photos or old Nintendo games. The organic nature of the material juxtaposes well with the synthetic coloring. This exhibit is set to be a larger market calibre show. Indeed, both artists have exhibited internationally. The fact that both artists are part of our local scene, though, gives the exhibit added value. The Centre Gallery is fitted with an installation that more than resembles a little kid’s fort in a 1970’s living room. What I would give to keep my dignity and crawl around gleefully through the installation! Perhaps, it was the closest I’ve come to foraging. I don’t make it to the USF campus as often as I’d like. I was lost looking for the USF Centre Gallery, ready to give up, and about to set up camp for the night at the bus stop in front of the Sun Dome. However, USF is once again impelling me to make the trip and I intend to brave it. This time we’re heading to the USF Contemporary Art Museum. 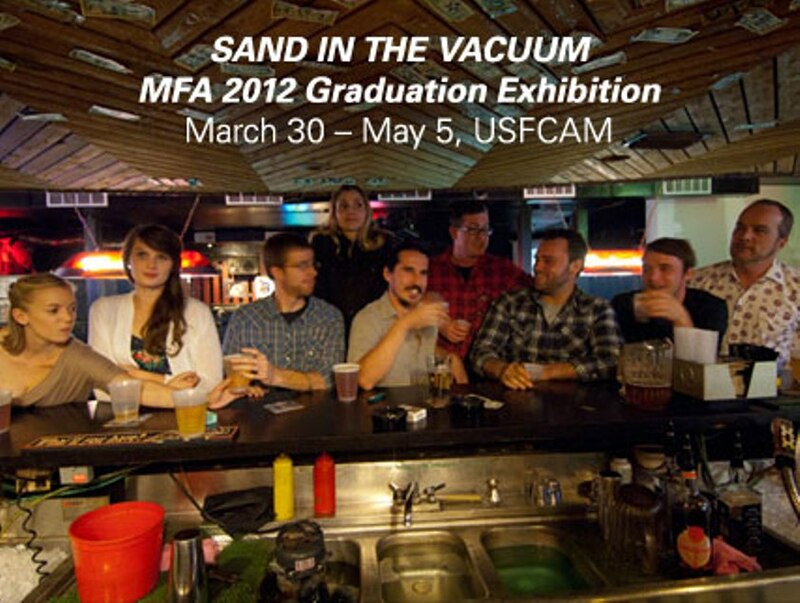 This Friday USF CAM and the USF School of Art and Art History will be introducing the 2012 graduating MFA artists through a group exhibit. I see that reluctant look on your face (that’s right, I can see you through your webcam). You’re worried this could be a show of almost-artists. You can be at ease, though – this isn’t like your elementary school graduation exhibit. Rather, these MFA graduates are (or should be) artists in their own right and some already have rather impressive and long CV’s. For example one of the exhibitors, Biff Bolen, brings some of the most exciting painting locally with past work being featured in New American Painting‘s MFA issue. 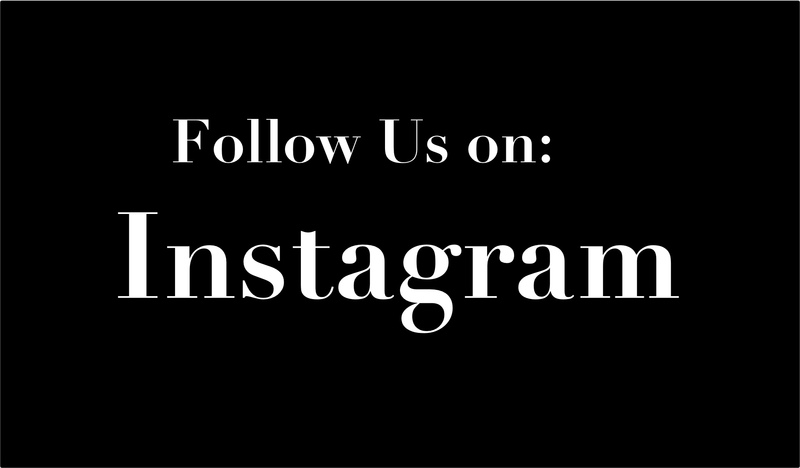 Also, look out for work from Cynthia Mason and Serhat Tanyolaçar among others. You can expect the exhibition to be an interesting and engaging one. Other than churning out degrees and massive student loan debt, MFA programs also allow artists to experiment without being hampered by saleability concerns. The MFA 2012 Graduation Exhibition will likely include style and mediums we encounter less often, particularly from area artists. I strongly suggest attending, enjoying the work, and attempting to convince the artists to stick around the Bay area and help out with the cause. The artist Sanford Biggers will be giving a free and public talk this Friday afternoon. 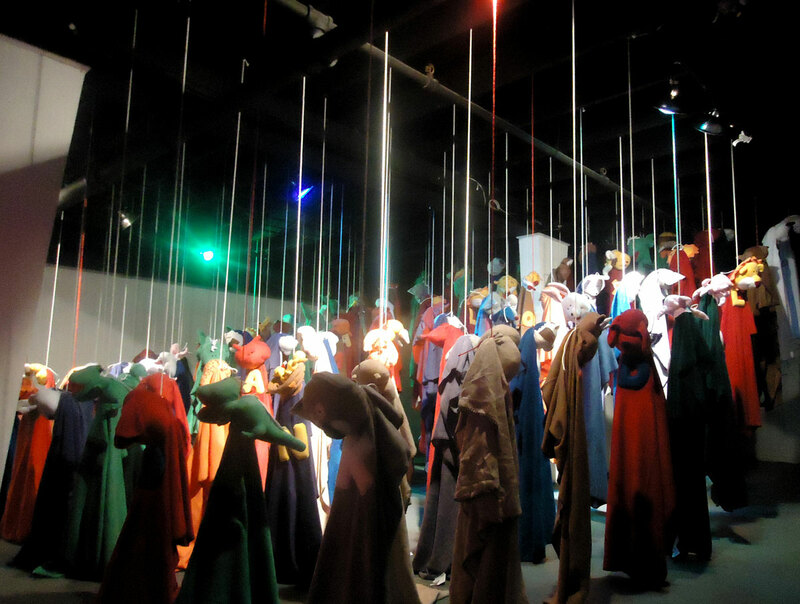 Biggers creates beautiful, politically and culturally aware installations. Biggers’ talk coincides with a new installation opening the same day at the Ringling Museum and being the 2010 recipient of the Greenfield Prize at the Hermitage Artist Retreat. I know it’s a bit of a drive for many of you, but the installation/talk combo should make the ride worth it. You know you’re going to stop by the Ellenton Outlet Mall on the way anyway. For the second week in a row my recommendation is split by the bay. Some feasible public transportation would make seeing both exhibits so much easier. Have you ever tried taking the bus from Pinellas to Hillsborough? It’s a perilous journey that could last days or even weeks. Please just drive in your car to both shows – I don’t want to hear a month from now that you’re camping out on the Courtney Campbell. Tempus Projects has been busy with two receptions in the space of a week. 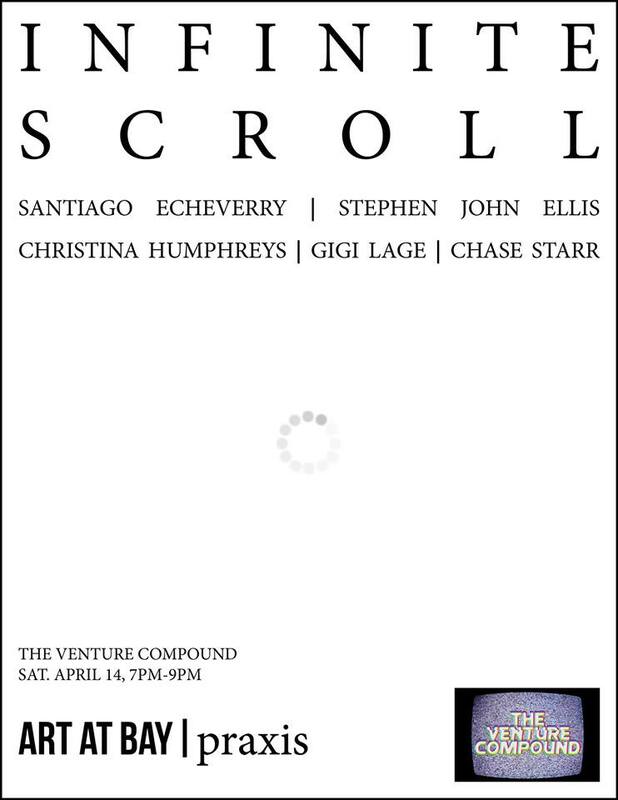 This Friday the art space shifts to the multidisciplinary work of three artists. 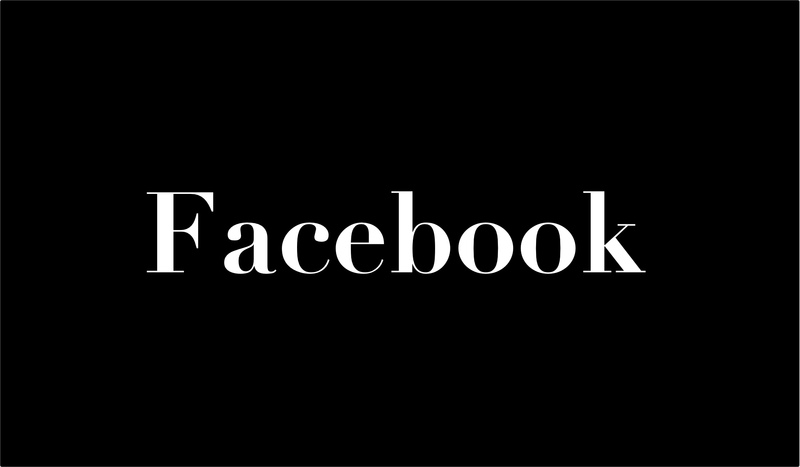 Kurt Piazza’s moody high-contrast video art is somehow at once slick and gritty. This makes for the kind of ambiguous image-play that can make video work particularly engaging. The abstract painting of Edgar Sanchez Cumbas will also be featured at the exhibit. Past work, though thoroughly abstract, seem to imply a hint of a whisper of figuration (yeah, that subtle). Cumbas’ current work that will be displayed departs a bit from his past paintings. Large hard-edged fields of color cover the canvas as if Cumbas cleared a space to begin working or is covering over work he has already done. Daniel Williams is an artist working out of my hometown of C-Water (as we all affectionately call Clearwater, though it’s confusing because it sounds like “sea water”). I don’t know as much as I should about Williams – a good reason to head to the exhibit. From what I can gather, his work is generally mixed media with strong geometric abstraction that would definitely look at home over at BOOOOOOOM. You may have seen some of his recent work at The Bricks in Ybor. Any of these artists alone is worth the visit to this trusty Seminole Heights gallery, but the interplay between the three of them is what will make the show. I knew the name Kirk Ke Wang sounded familiar. It isn’t because he’s a professor at Eckerd College or his various shows at major galleries and museums – I walk past his studio every time I need a beer and head to Independent Bar after a show at Tempus Projects. Kirk Ke Wang is one half of a dual show opening this Friday at St. Pete’s Salt Creek Artworks. 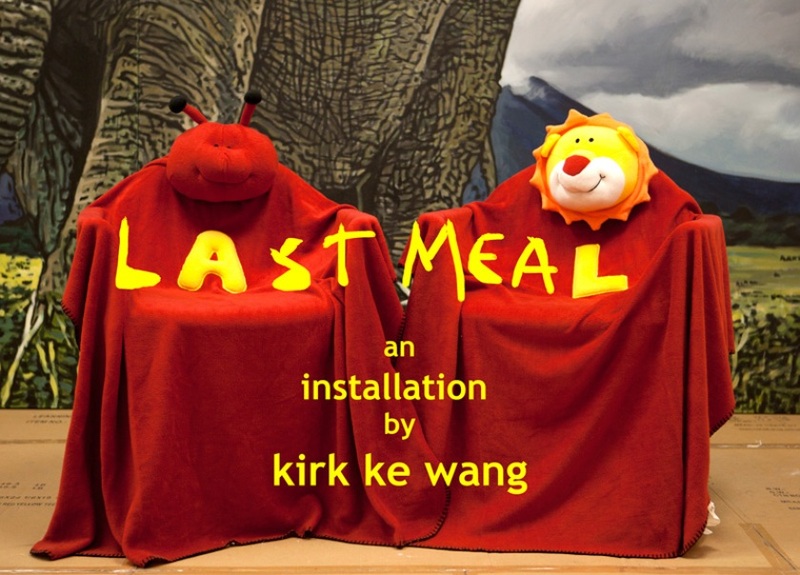 He’ll be presenting an installation titled Last Meal. Though the exhibit has been open since March 5th, I haven’t had a chance to see the installation yet. I’m interested in seeing if he draws from the idea of a prisoner’s last meal or the last meal of Christ. Though both ideas (and particularly the latter) are wildly overused, Kirk Ke Wang’s art has a wit that I’m confident will steer him clear of any clichés. His work is consistently impressive, that I anticipate will materialize well as an installation. Painter, Steven Kenny composes the other half of the dual show. Kenny’s paintings can be described as “surrealistic, symbolic”. I don’t want to ruffle any feathers here, but I’m really not that into Surrealism. To be honest, I really don’t like it at all past the 1930’s. However, I’m sure there’s a good percentage of you, readership, that do dig “neo”-surrealism. If you do, there’s a strong chance you’ll appreciate Steven Kenny’s work – he utilizes the style very well. Kenny’s technical skill is undeniable. With smooth and often imperceptible brush strokes as well as an expert depiction of the human form, the prevalence of the genre and his work is easy to understand.